Yopo Cafe (web site, 1122 Homer Street, Vancouver, BC, phone: 604-609-9676) is a tiny, bright, well kept Chinese restaurant in the upscale Yaletown shopping/restaurant district in downtown Vancouver. 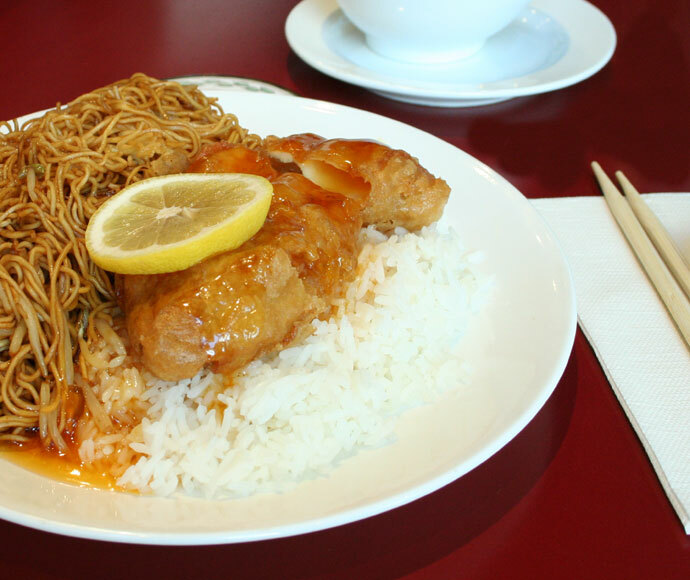 Lunch specials such as the lemon chicken on rice with shredded pork chow mein (pictured below) are served with soup, and are a reasonable $7.00 (or $6.45 if you get just one of the items). This restaurant is very popular for take out, and the kitchen is quite fast. They also offer an extensive Chinese food menu with over 100 items, which is pretty amazing considering their tiny kitchen. And what’s more, they provide free Chinese Food delivery to the Vancouver area for orders $20 and up, from 6:00pm to 9:00pm. 26,846 views. This entry was posted on Thursday, September 13th, 2007 at 6:26 pm	and is filed under Asian, Casual, Chicken, Chinese, Comfort food, Delivery, Downtown, Fast Food, Food Photos, Lunch, Lunch Specials, Modern Decor, Restaurant, Take Out, Vancouver, Vancouver Restaurants, Yaletown. You can follow any responses to this entry through the RSS 2.0 feed. You can leave a response, or trackback from your own site.